We can make a very strong case that astronomy is the world’s oldest profession. Back in the days before artificial illumination, the nights were dark indeed, and what you could see with the unaided eye was something like the above image. That’s a lot of stars. In a light-polluted urban environment, you might see the brightest 5 of those stars. 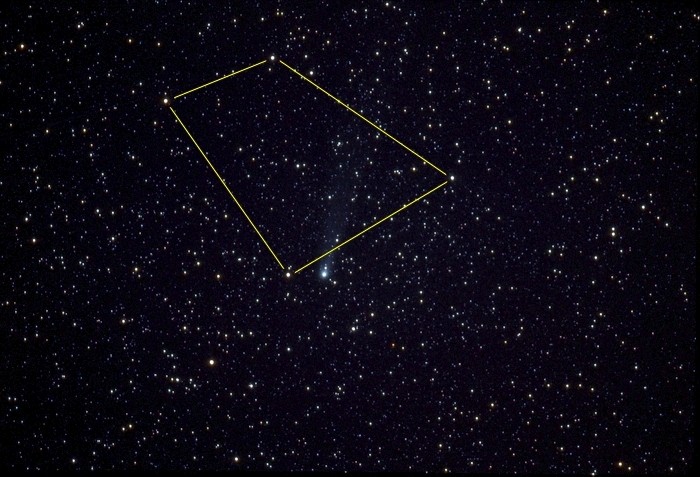 The image above is a 1-hour tracked exposure of Halley’s Comet when it was moving through the faint constellation Crater (The Cup) back in 1986. Only part of that constellation is captured in my image; to see its full shape, click on the thumbnail. Scientists are not sure exactly when our species developed what we would today call “intelligence.” Estimates range from 50,000 years ago to more than 100,000 years ago. The night sky (when you can see it) looks pretty much the same now as it did back then, with the same stars and constellations. And if you’re up at night, you will not only see the sky — you’ll start to notice patterns and learn some useful facts. The spatial patterns (groups of brighter stars) were traced like dot-to-dot images, given names related to their shape, and became the constellations. There are 88 such groups officially recognized by the IAU. Crater takes its name from Greek mythology, but other cultures see other patterns. 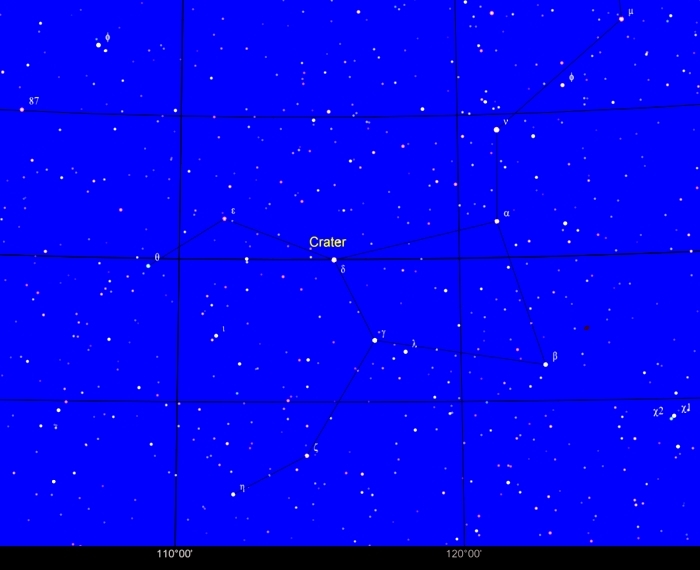 In Chinese astronomy, Crater is a subset of a larger constellation called Vermilion Bird of the South. Whatever patterns you see, they are easily recognized, familiar images from your culture, never changing in shape or size, and instantly orienting you in space and time. But it’s the temporal patterns that reveal the most useful information. Objects in the sky, including the Sun, Moon, and stars, move around in cyclic patterns that repeat regularly, and can serve as the basis for a time-keeping system. Longer-term cycles give you advance warning of seasonal changes, something essential to survival: When to plant and harvest, when to gather wood for heating, when to intercept the migrating game. When you’ve learned the patterns in the sky, you have acquired a tool that allows you to navigate the entire surface of the planet. Without a magnetic compass, you can know the directions, as well as your position. You can use this for mapping, exploration, or migration. One of the things you’ll experience when you see a pristine night sky is a sense of awe and wonder. And that’s just from the stars themselves. Throw in a meteor shower, comet, aurora, eclipse, or lightning, and it’s not surprising that every early religion placed at least some of their deities in the heavens. The human species has a natural sense of curiosity, a desire to see patterns, to predict, and to simply understand. In this modern era, those bullet points above have become largely irrelevant. The need to understand the sky has been replaced by technology: calendars, clocks, magnetic compasses, GPS, NWS, and HVAC do that work for us. Shortly after moving to the Williams, AZ area I attended a star party at Wupatki National Monument. As the ranger was getting a telescope set up, I was going to point out the Swan constellation. As I looked up there were so many stars in the sky I could not find it at first. It had been years since I had seen such dark skies. Though not all care or cooperate, it’s wonderful living where people care about seeing the stars. Same thing happened to me once. I had learned the constellations under the not-so-friendly skies of the Midwest. First time I traveled out west, we camped near the Grand Tetons. After dark I ventured out of the tent for a look around, and was bewildered by a display of stars easily down to magnitude +6. 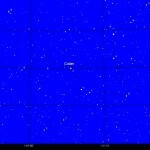 Took me awhile, but once I found Polaris I was able to get oriented.